Written by Carl Anthony, Managing Editor at Automoblog.net for Autonomoblog.net. Re-purposed for AutoSens 2018. What is an autonomous car? It seems easy enough – a vehicle that operates itself – but a recent study found some confusion. Fewer than half correctly identified an autonomous vehicle as one controlled entirely by autonomous technology. About 40 percent believed it was a half and half approach: the car had autonomous technology but could still be operated by a human. 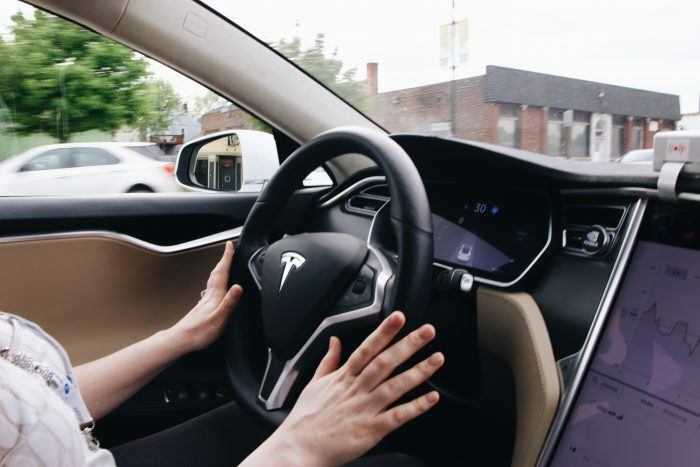 Around 11 percent said it was still fully controlled by a human, just with a few extra features like self-park or blind spot monitors. The study even found that almost a quarter have yet to read or see a single story in the media on autonomous driving. Somewhere in the pipeline, a communication breakdown is happening. We need to ask, as autonomous driving stands on the horizon, can we have faith in something we cannot understand? If there is disconnect between what the industry defines as an autonomous car and how the pubic perceives such technology, how can they accept it? If people don’t understand it or cannot conceptualize it, they are less apt to believe in it. Consider the average home and the regular family. Normal people, normal lives, normal cars. The ones who load up their groceries and kids in a minivan or sedan. There are many such sensible people – they are not car people, just people with cars. For them, when they buy a vehicle, they have to trust it. They must know it’s fuel efficient and cost effective; that it’s reliable and safe. Safety is key. Let’s say a person were only half sure a particular blender would nicely mix their favorite protein powder and a banana. They probably wouldn’t buy it. If the blender had a million buttons, and it was hard to tell which button does what, they might shy away from it. And how much more complicated an appliance is an autonomous car? The subject then dissolves into a flurry of “if onlys.” If only it were possible to identify all the challenges facing automated driving; if only it were possible to devise the solutions; if only it were possible to get the industry’s forward thinkers under one roof; if only it were possible to determine those critical and clear messages for the public. If only we could do that, autonomous cars might have a shot. Photo: Alex Hartman for Sense Media. AutoSens, a global summit on autonomous driving, recently concluded its 2018 Detroit conference and moved the “if onlys” to “how cans.” How can we actually do all these things? How can industry and the public arrive on the same page? How can terms like “autonomous” and “connected” and “perception technology” be easily digested by the public? How do we give sound meaning to these often hyped up buzz words? Before cars can be connected, and consumers can feel confident being connected to them, engineers must first feel confident connecting with each other. With this “if only” addressed, the conference went to work. 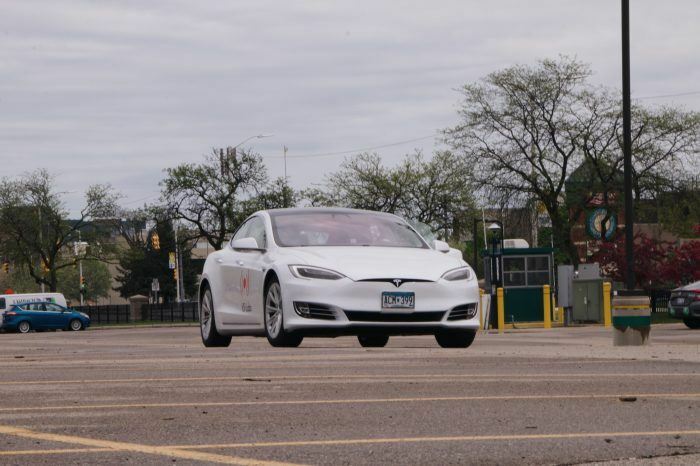 Representatives from VSI Labs perform an autonomous driving demonstration in the company’s Tesla at Wayne State University during AutoSens Detroit. Photo: Alex Hartman for Sense Media. The first day – Tuesday May 15th – saw numerous demonstrations at Wayne State University. Attendees could ride in three different autonomous vehicles, from three different companies: a Lincoln MKZ outfitted with self-driving technology from Autonomous Stuff, a Chrysler Pacifica equipped with a special kit from Dataspeed, and a Tesla from VSI Labs which the company routinely benchmarks. The remainder of the week was filled with expert speakers and panel discussions covering a range of topics from safety and privacy to technical innovations. Speakers included representatives from Ford, General Motors, Toyota, and Jaguar Land Rover, and major suppliers like Bosch, Valeo, and Magna. Representatives from MIT, Carnegie Mellon, University of Washington, and the University of Michigan also spoke. Mark McCord, Vice President of Engineering for Cepton, speaking at AutoSens Detroit. Photo: Alex Hartman for Sense Media. Mark McCord, Vice President of Engineering for Cepton, a company that develops high performance LiDAR was one of this year’s presenters. 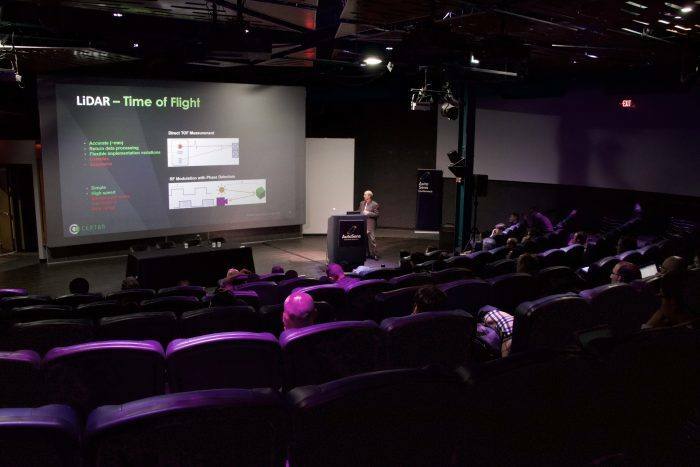 His session covered LiDAR in-depth, including the current market, the mainstream approaches in development, and what its role might be in our future cars. McCord believes organizers made the right choice returning to the Motor City this year. Between sessions, attendees could chat during coffee breaks and over lunch. On the final day of AutoSens Detroit, Arm Inc., a processor company from San Jose, California, organized a breakfast where engineers could enjoy warm food and good discussion. Like other attendees, representatives from Arm Inc. came with specific goals. 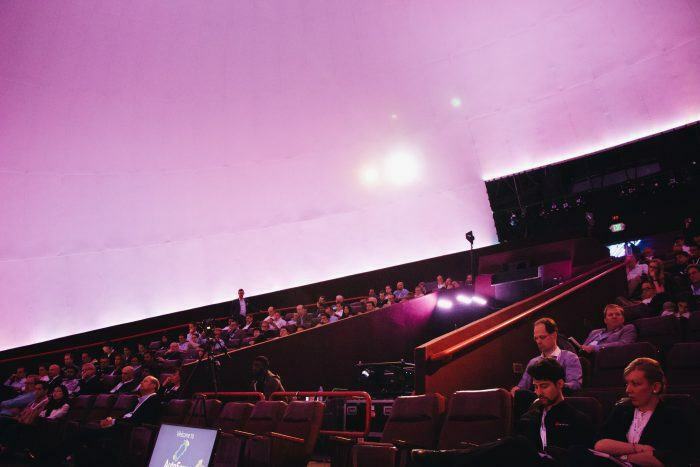 AutoSens Detroit featured a full panel of expert speakers inside the Chrysler IMAX Dome Theatre at the Michigan Science Center. Photo: Alex Hartman for Sense Media. Organizers continue to advocate for females in the engineering community and encourage women to participate in the critical discussions at AutoSens. Although there are more males in the arena currently, the ratio is slowly balancing. 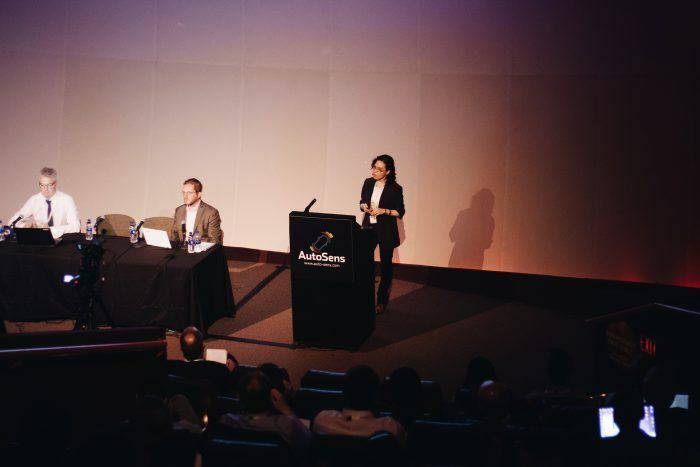 Cognitive scientist Dr. Mónica López-González, Co-Founder and Scientific & Artistic Director of La Petite Noiseuse Productions, speaking at AutoSens Detroit. Photo: Alex Hartman for Sense Media. When considering autonomous driving, the rate at which the technology is advancing, and the lasting impacts it will have on society, there is a dire need for AutoSens. An open forum that encourages the industry to take aim collectively at the challenges facing automated driving is vital. AutoSens is that forum. We need to have these discussions and AutoSens gives us that opportunity. For us in the automotive media and the industry at large, this is critical as we seek to responsibly inform the public about autonomous cars. In a perfect world, engineers design and build autonomous cars, and those of us in the media and the industry at large, inform the public as to the exact capabilities of the car. The pubic, then after having the correct information, gradually warms up to the idea of being driven versus driving. It must work exactly in this order, and the success of the latter depends on how proficient we are at the first two. There is great comfort knowing the engineers and researchers working on this technology have families and loved ones too. They see our own families in the same light, and they are in it to save lives, no question, no doubt. The more we as an industry communicate this to the public the better. These discussions turn autonomous cars into trusted vehicles as opposed to rolling boxes of lights and sounds. Dataspeed Founder Paul Fleck (black shirt, jacket, middle) talks with AutoSens Detroit attendees. 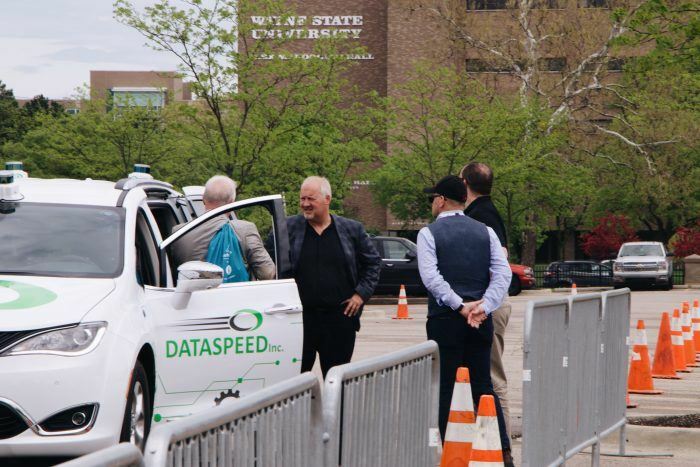 Dataspeed showcased the company’s ADAS Kit which helps engineers maximize their development of autonomous systems in the field. Fleck, an engineer himself, lost a loved one in an auto accident. The experience has led him to develop technology he believes will save lives. Photo: Alex Hartman for Sense Media. This process might seem oversimplified, idealistic or even asinine, but it’s no more harebrained or impossible than a world where cars don’t crash. We just have to get there. It won’t be tomorrow or next year – it might be 50 years, but we will eventually get there. AutoSens is helping us take the necessary baby steps toward this granddaddy of a vision; a vision where autonomous cars are the catalyst of a better future. The future, however, is shaped by the present. Like anything worth doing well, autonomous cars need our utmost attention. We will reap in the automated world what we sow in the non-automated world. AutoSens serves as a way to keep us on track, encouraging us to have those meaningful conversations, first among each other as an industry, then with the public. And in the industry, good things are happening.